Lovely Chalets in Samoens, Sixt area, French Alps. 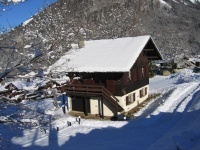 Ski Chalets to rent. Great skiing, fab food, fantastic scenery. "Welcome" Let's talk about: Local Knowledge, Equipment Hire, Lift Passes & Lessons. One of the most important things when you arrive and begin your ski holiday is to sort out your equipment hire, if required, and lift passes. This can be quite a worry to some and can also take precious moments out of your ski time, all too short when you might only have a week. It is very important to us to assist you with this, making everything very simple and stress free enabling you to get out onto that beautiful snow as soon as possible. On arrival at the chalets your host, Will G, will sit and enjoy a relaxing drink and discuss your invidual requirements with you. He can advise about coaching, guiding, equipment and lift passes and get a feel for the sort of things you might like to do whilst staying at Chalet L'Oreade. When you are ready he will take you to the local ski hire shop to meet Sebastian or another member of the Deffayet family who own and run Chez Narcisse. They are one of the main families in the area and have run the equipment business for many years if not generations. His sister is one of the ESF ski instructors in Sixt and you will receive an expert and very friendly personalised service. Snowboards are also available for hire from Will through our sponsorship with Ride. With his knowledge of the mountain and professional coaching background, Will is able to guide you through your thought processes and requirements about coaching and what you want out of your ski holiday. Although not born to the mountain, Will G has skied most of his life and became a professional snowboard coach in 2001. We also have no hesitation in recommending several of the ski schools on the mountain ESF (Ski and Snowboard school) 360 International (Ski and Snowboard school) ZigZag (Ski and Snowboard school) - click here for our link. Snowboard lessons and a half day or day with your host (Will G) on the mountain can be prebooked and paid for in the UK in advance. The next step is to sort out the lift passes and we are fortunate in that one of the main lift pass offices "Caisse" is only 50 meters from our base at Chalet L'Oreade opposite the nursery slopes and right next to the ski bus stop. So, the choice is yours, you can be on the slopes within an hour of your arrival at the Chalets, having unpacked and relaxed for a moment if, of course, you are a quick unpacker!!. 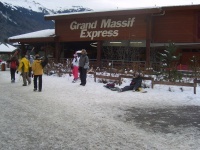 2016/2017 prices are on the Grand Massif Website"
Grand Massif - this covers the whole area (265 kms of piste)including Flaine and is recommended for all but beginners, there is nothing worse than being denied a run when you find yourself in a different ski area. Adult 242.40 € for 6 days. 45.50 €/day for 2 - 5 days. Junior (5-15 years) 181.80 € for 6 days. 34.10 €/day for 2 - 5 days. 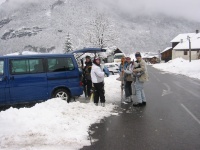 Massif - (145 kms of piste) Les Carroz, Morillon, Samoens, Sixt, Combe de Vernant, Les Grand Vans. Adult 213 € for 6 days. 40.00 €/day for 2 - 5 days. Junior (5-15 years) 159.60 € 30.00 € for 2 - 5 days. Beginners - Adults from 8.90 € (Sixt), 16.60 € (Morillon) 22.00 € (Samoens) per four hours. Juniors (5 - 15 years) 8.90 €(Sixt) 12.40 €(Morillon) 16.50 €(Samoens). 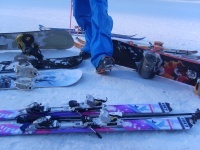 It is advisable to check depending which area you intend to ski with beginners. The instructors will advise when it is necessary to purchase other types of lift passes. Cross Country Ski Trails have separate passes and you should talk to the local Tourist Information Office, who will advise you of the areas available and the best places to go. Lift passes can be preordered on line. Passport photos are no longer required. Ski/Lift Passes give free access to all ski bus routes from Salvagny,Sixt to Verchaix through Samoens, Vercland and Morillon. They do not all go the full route, so be sure to check you get on the right one. 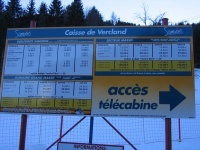 Timetables are kept at Chalet L'Oreade, so please ask if you would like one.